No picture available at the moment: I'll add it later. 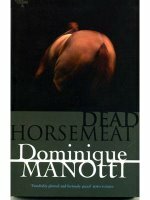 I've been waiting impatiently for Dominique Manotti's Dead Horsemeat for several years, since reading her excellent police procedural Rough Trade when it first came out in English. Manotti places her procedurals into carefully constructed historical milieux: Rough Trade occurs in the middle of an immigrant workers' strike in the clothing trade (the original French title of the book refers to the dark Sentier, the rag trade district). Dead Horsemeat uses the student rebellion of 1968 and the fall of the Berlin Wall to bracket a story about drug trafficking, prostitution, horse trading, and corruption in high places. Manotti's chief detective, Daquin, is openly gay (a major factor in Rough Trade, less central here), giving him an edge as an outsider within the close community of the drug squad in Paris. A new member of the team is brought in to provide expertise in the horse-racing scene, and the crew works diligently through a complex plot evolving from the horses to drugs to pressure from government officials. Manotti is one of the few crime novelists who has, even in translation, her own style. She uses the present tense, clipped phrases, and tense dialogue to create a fast-moving story with the flavor of the streets. Rough Trade was a revelation, and if Dead Horsemeat doesn't quite measure up, it's only because the first novel created such expectations for the second. But the links to recent French and European history provide a grounding in a broader context that makes Dead Horsemeat resonate even more than Rough Trade (which was itself very resonant) in our own world, almost two decades down the line since Manotti's tale. This one is Very Highly Recommended! And if you haven't read Rough Trade, get it asap.